We speak the language of disruption. 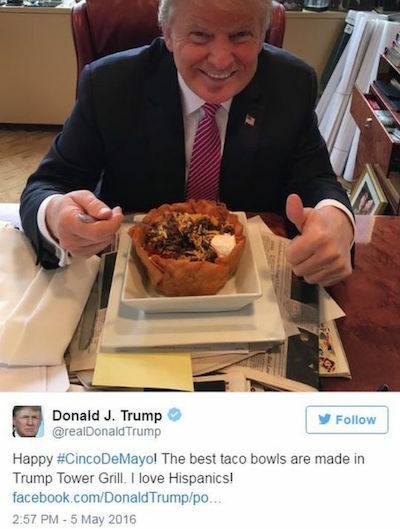 And we love Tacos! ¡Bong! The Mar-a-Lago Club is like the 1960s. If you can remember it, you weren't there. Let me be clear: I have no memory at all of any long, debauched evenings at the luxurious Miami mansion belonging to Donald J Trump. Not one. So that's cast-iron proof, if any is needed, of my uniquely close personal relations with America's new President-elect. Whom, of course, I have never met. Like many of you, I woke up last Wednesday [ shocked and appalled || delighted and thrilled ] ( มาลัย, please delete according to the publication - sjb) [at || by] the election of Mr Donald J Trump as the President of the United States. The Trumpster is a man whom I have always [ disdained as a thin-skinned vindictive bigot || admired as a plain-speaking disruptor]. What you might not know is how close we are. You may scoff. At first sight, it is an unlikely friendship. Trump isn't the guy you'd turn to first to evaluate your Mindfulness app. The areas he and I dominate, of course, couldn't be more different. Trump is the master of the old vices, like casinos – not the new vices, like aggregating metadata and targeted contextual advertising. I'm a proud global elitist. Donald hates anywhere outside the USA except that bit of Scotland he owns. But we have more in common than you might suppose. Both Trump and the Bongster have had to work hard to make it from deprived backgrounds – his in Queens, mine in Switzerland – with only the odd few million dollars from our wealthy and successful fathers to help us bootstrap ourselves on our way. Both Fred Trump and my dear Pappa benefited hugely from government contracts – a lesson I have always heeded. And, in fact, made the basis of my entire investment strategy: from my "Minute of Code" initiative in schools to the many catapults that fund my digital startups. Government money is "ambient crowdsourcing" – so ambient, people don't even notice the cash evaporating from their pay packets. Both Trump and I have also both innovated in labour relations, which is basically all the innovation that you get in the "sharing economy". One can't, hand on heart, really say that one is a digital pioneer until one has racked up dozens of labour relations lawsuits. Naturally, we both base our hiring on more than just skills and temperament. Who wants some old frump casting her gloomy phizog over your workspace like a cloud? As my assistant มาลัย (which means "Garland of Flowers" in Thai) was pointing out just the other day. "Liberalism is extremely harmful in a revolutionary collective. It is a corrosive which eats away unity, undermines cohesion, causes apathy and creates dissension. It robs the revolutionary ranks of compact organisation and strict discipline, prevents policies from being carried through and alienates the Party organisations from the masses which the Party leads. It is an extremely bad tendency." Trump is famous for telling entrepreneurs who fail "You're Fired!" while I am famous for eating them... although only in in exigent circumstances. Unfortunately, many on "my" side – the respected entrepreneurs and thought-leaders of Europe's "liberal elite" e.g. Mike Butcher MBE – have taken The Donald's comments at face value, without really looking at how much we have in common. Some think his election is a revolt against the Silicon Valley oligarchs. But underneath it all, business is business. At first Peter, too, was petrified. Then I reminded him how useful it would be to have a president who could close down the nuisance press. But rebrand it as a clampdown on "hate speech", or "fake stories", upon which everyone would agree that obliterating unhelpful, negative outlets is the right thing to do. As Mao Tse-Tung wrote in 1945: "Anyone should be allowed to speak out, whoever he may be, so long as he is not a hostile element and does not make malicious attacks." So it shall be: America's Great Helmsman following in the footsteps of China's. And I also reminded Peter how much Donald would appreciate his elixir of eternal life: baby unicorn blood, to be injected twice a week. Peter signed on. Next came the task of persuading Donald that he could do business with Mr Completely Offshore. Trump, remember, is a man who has famously never read a book since he was at school, and hates shaking hands. But this turned out to be easier than I thought. 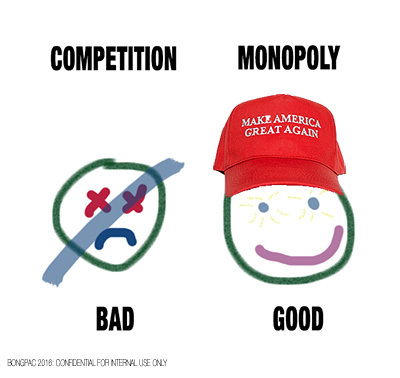 I merely had to translate Peter's tour de force, his essay on capitalism and monopolies, called Competition is for Losers. So, voters. Forget all the guff about the "masses taking on the elites". Us capitalists have got it all figured out, and we will take care of business. And my message to Teresa May: Let me be your conduit to Trump. He's promised to brief me long before he informs your grey men, and the clueless numpties at the FCO, that he is starting World War III. Useful information to have in advance, no? Just call Mar-a-Lago reception, and ask to put through to The Bongster.